What Is VA Form 10-5345? VA Form 10-5345, Request for and Authorization to Release Health Information is a document issued by the Department of Veterans Affairs (VA). It is used to get a veteran's written and signed authorization to release their medical data according to the Health Insurance Portability and Accountability Act. The VA may also apply the details provided in this paper to identify the individuals claiming or receiving any VA benefits. The latest version of the form was released by the VA in September 2018. An up-to-date fillable version of the form is available for download below or can be found on the VA website. You are required to submit your request to VA if you need to disclose your medical data to any individual or organization for treatment, employment, legal or other purposes. You must fill out this document when submitting an application for VA benefits. 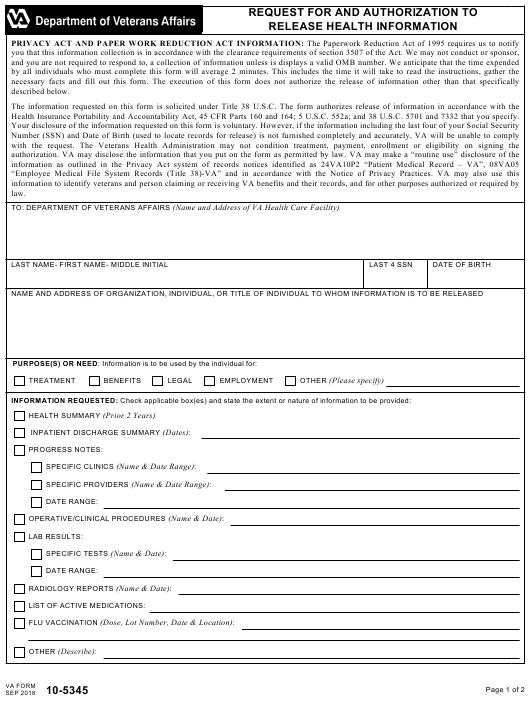 VA Form 10-5345a, Individuals' Request for a Copy of Their Own Health Information, used for requesting a copy of a health record maintained by the VA.
VA Form 10-5345a-MHV, Individual's Request for Med Record from MyHealtheVet, used to request a copy of a medical record through a MyHealtheVet account. Health Insurance Portability and Accountability Act, 45 CFR Parts 160 and 164; 5 U.S.C. 552a; and 38 U.S.C. 5701 and 7332 that you specify. purpose(s) listed in this authorization. other future requests unrelated to this authorization. unauthorized redisclosure, and the information may not be protected by federal confidentiality rules. Regional Office that specializes in benefit decisions. EXPIRATION: Without my express revocation, the authorization will automatically expire. If you are not able to request the release of medical records, it can be done by your legal representative. The data provided via this document may be re-disclosed to the same recipient. How to Fill out VA Form 10-5345? Sign and date the form. The paper can be signed by your legal representative. The bottom of the form is reserved for VA use only. Where to Send VA Form 10-5345? The completed and signed VA 10-5345 should be sent to the specific VA health care facility where the veteran was treated. In case you need to release medical information concerning treatment in several different VA healthcare facilities, you are required to submit the separate form to each of them.